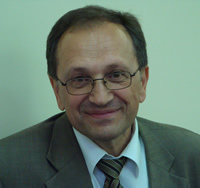 Dr. Igor V. Belokonov has served Samara State Aerospace University since 1976. Currently he is the Head of Department of Space research, Professor of Dynamics Flight and Control Systems of Samara State Aerospace University, Vice-President and Executive Director of Volga Branch of Russian Academy of Cosmonautics, and General Director of Samara Scientific Center of Space Technologies. He obtained DIPL. ENGINEER, KUYHBUSHEV AVIATION INSTITUTE in 1973, CAND. OF TECH.SCI., KUYHBUSHEV AVIATION INSTITUTE in 1976, and DR. OF TECH. SCI., SAMARA STATE AEROSPACE UNIVERSITY in 1999. His research interest includes ballistics, navigation and guidance in space, optimal planning and algorithms of satellite radio navigating for spacecraft. Other activities and responsibilities include Academician of Russian Academy of Cosmonautics (1997 - present), Academician of International Academy for Navigating and Motion Control (2006 - present), Foreign Member of “Institute of Navigation” (USA) (1998 - 2002), Member of Editorial Boards of “Aerospace Instrumentation Technologies”, “Control and Computer Science” Journals, the Head of Russian-European Summer Space School “Future Space Technologies and Experiments in Space”(2003, 2004, 2006, 2007, 2008, 2009, 2011), etc. He participated in the experiments on space vehicles Foton-12 (1999), Foton-M2 (2005), Foton-M3 (2007). He published more than 200 science articles.